Loreen is going to Afghanistan? Is Eurovision winner Loreen planning a trip to perform in Afghanistan? Well the “Euphoria” singer spent yesterday with the Swedish Foreign Minister Carl Bildt where they discussed the current situation in Afghanistan. Now we all know that Loreen is a strong political activist – so we thought that her meeting with Minister Bildt was her discussing Swedish politics and the role they should possibly take. 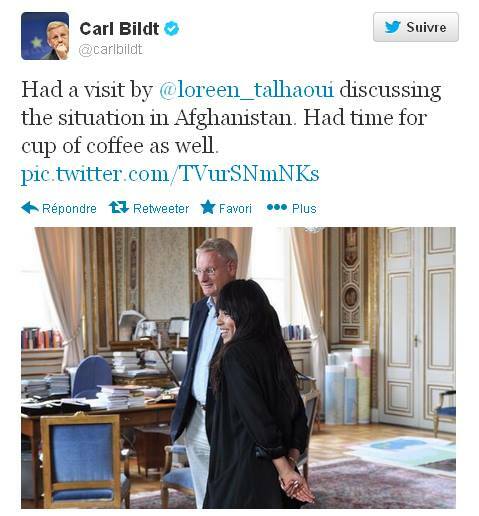 However Loreen herself took to twitter thanking Minister Bildt for his time and then saying that following her meeting with the Foreign Minister “Planning A Trip”. At this point her twitter account went alight with people suggesting that Loreen was indeed off to Afghanistan. The likelihood of Loreen going to Afghanistan – well we think is strong. It would certainly be something that her political consciousness would be interested in. Alternatively she could be planning a vacation to say Ibiza, either way we will keep you updated. Loreen recently performed at the closing celebrations at the World Out Games 2013 in Antwerp. Where to next for Loreen? A group of Swedish “field artists” (as they are known) are going to perform for Swedish soldiers in Afghanistan in a few weeks time. One of those confirmed for the Afghan trip is Linda Sundblad – that you will know from Melodifestivalen – and also one of Loreen’s musicians. Maybe Loreen will be joining this group of artists?